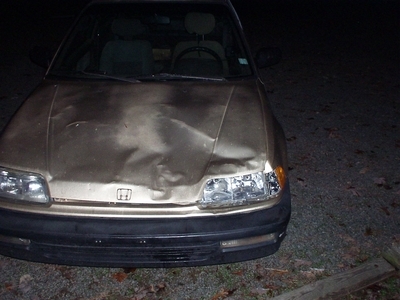 Ima hafta get me a hunting license now... or stop driving home from Chapel Hill at night. Have you seen the Mythbusters episode when they hit a moose? It was kinda like that (but it was a deer- see previous post). The dang thing splattered and flew up onto the roof, over the vehicle. The big dent in the roof mostly came out by hand but i need a new hood and headlight at least. I can live with the messed up fender maybe. seems like I just replaced that headlight recently too. Dang. If you can believe it it's actually worse than it looks in the picture. I haven't looked at the back of the vehicle yet. For now we'll assume it is undamaged. At least it didn't get your windshield as well. Glad you're OK.